South Korea will be more active in attracting foreign companies with high-end technologies, offering better incentives and improved regulations, according to the government Tuesday. “We will focus on attracting foreign companies that can upgrade the nation’s traditional manufacturing sectors -- petrochemicals, high-end manufacturing, materials and automobiles -- by integrating with new services and technologies,” said Lee Ho-joon, chief of investment policy division at the Ministry of Trade, Industry and Energy, during its quarterly event for foreign companies in Seoul. “The government plans to actively attract regional offices of global companies in the areas of chemistry, machinery and materials as well as global research and development centers in the industries including health care and information and communication technologies,” Lee said. The ministry will also focus on luring investments in the research and development areas of electric and self-driving cars, health care, smart homes, energy efficiency, hydrogen energy, high-tech materials and 3D printing. For that, the government measure will shift toward business-friendly cash incentives, setting aside a budget of 50 billion won ($44 million) this year, up from 6 billion won last year. 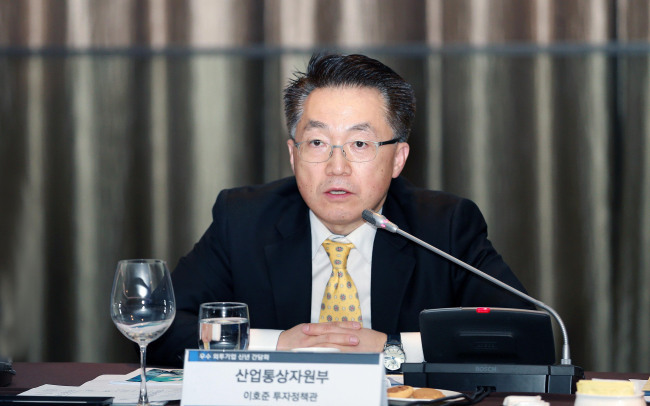 Separately, a fund of 50 billion won was formed last month to preinvest in promising, small firms for them to earn trust from foreign investors. The government will also remove redundant and inefficient regulations for foreign companies doing business here. “We will make efforts to address regulatory challenges foreign companies face. We found issues, for instance, related to installing hydrogen car charging stations in city areas, or to saving personal information in cloud services by financial organizations,” Lee said. The installation of hydrogen car charging stations has been slow in Korea due to safety issues and burdens of operating costs. The global market is currently dominated by three global firms, Linde, Air Liquide and Air Products & Chemicals. For cloud services, Korea has conservatively sought to protect personal information stored in the cloud on issues of safety. The global cloud market is dominated by Microsoft, Google, IBM and Amazon Web Services. “We will push to improve regulations in many areas this year to better allow new products and services to be launched in the market,” Lee said. The government will also step up efforts to attract customized investment and projects to strengthen the regional industrial ecosystem. For instance, the ministry will focus on luring investment in the areas of new renewable energy and hydrogen cars for North Jeolla Province and high-tech energy and air appliances for Gwangju and South Jeolla Province. It will also center on attracting investment in chips and small cars for Busan and South Gyeongsang Province and self-driving cars for Daegu and North Gyeongsang Province.